The insulator conductor house in an armature slot is known as an armature winding. In armature winding, the conversion of power takes places, i.e., in the case of the generator the mechanical power is converted into an electrical energy and in the case of a motor the electrical energy is converted into mechanical energy. The armature winding is mainly classified into two types, i.e., the lap winding and the wave winding. One of the major difference between them is that in a lap winding the end of each coil are connected to the adjacent segment whereas in the wave winding the end of armature coil connected to commutator segment at a distance apart. Definition The coil is lap back to the succeeding coil. The coil of the winding form the wave shape. Connection The end of the armature coil is connected to an adjacent segment on the commutators. The end of the armature coil is connected to commutator segments some distance apart. Parallel Path The numbers of parallel path are equal to the total of number poles. The number of parallel paths is equal to two. Other Name Parallel Winding or Mulitiple Winding Two-circuit or Series Winding. Uses In low voltage, high current machines. In high voltage, low current machines. In lap winding, the consecutive coils overlap each other. The first end of the winding is connected to the one segment of the commutator, and the starting end of the other coil is placed under the same magnet (different pole) and join with the same segment of the commutator. The conductors are connected in such a way that the number of parallel paths equals to the number of poles. Consider the machine has P poles and Z armature conductors, then there will be P parallel paths, and each path will have Z/P conductors in series. The number of brushes is equivalent to the number of parallel paths. The half of the brush is positive, and the remaining is negative. The lap winding is mainly classified into two types. They are the Simplex lap winding and the Duplex Lap winding. Simplex Lap Winding – In this winding, the number of parallel paths is equal to the number of poles. Duplex Lap Winding – In duplex lap winding the number of parallel paths is twice to the number of poles. The one end of the coil is connected to the starting end of the other coil which has the same polarity as that of the first coil. The coils are connected in the wave shape and hence it is called the wave winding. The conductor of the wave winding are split into two parallel paths, and each path had Z/2 conductors in series. The number of brushes is equal to 2, i.e., the number of parallel paths. In lap winding, the coil is lap back to the succeeding coil whereas in the case of the wave winding the coil are connected in the wave shape. In lap winding, the end of the armature coil is connected to the adjacent commutator segment, whereas is wave winding the end of the armature coil is placed in the commutator segment which is placed apart. In lap winding the number of parallel paths is equal to the total number of poles of the coil and in the wave winding the number of parallel paths is always equal to two. 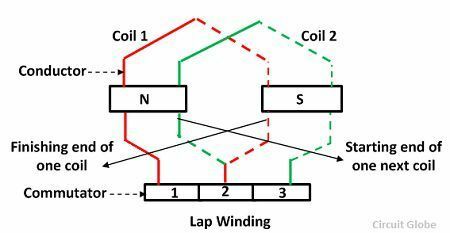 The lap winding is also called parallel winding because their coils are connected in parallel whereas in the wave winding the coils are connected in series and hence it is called series winding. The emf of the lap winding is less as compared to wave winding. The lap winding requires equaliser for the better commutation. The wave winding requires the dummy coil for giving the mechanical balance to the armature. In lap winding, the number of brushes is equal to the number of parallel paths whereas in wave winding the number of brushes is two. The efficiency of the lap winding is less as compared to the wave winding. The simplex and duplex are the types of lap windings. In simplex winding, the number of parallel paths is equal to the pole, in duplex winding the pole is twice to that of a parallel path, whereas the progressive and the retrogressive are the types of the wave windings. The winding cost of the lap winding is more than the wave winding because it requires more conductor. The lap winding is used in low voltage, high current machines, whereas the wave winding is used in high voltage, low current machines. The dummy coil in the wave winding gives the mechanical balance to the machine, and it is not electrically connected to the wave winding.